Here are healthy suggestions that will get you started towards a healthy diet. Make a good diet change today and maintain it for you to realize a healthier you. 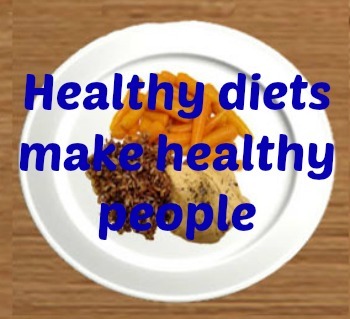 A healthy diet is essential for a person to maintain good health and psychological well being. A wide variety of foods is key to healthy living. Many people get stuck in ruts where they eat too much of one type of food. This leaves their body with excessive nutrients in one area, and none in another. No one likes to eat the same thing every day, but sometimes we do for the pure convenience of it. There are a variety of foods that you can add to your diet to keep it from becoming stagnant and boring. There are hundreds of fruits and vegetables available at the average grocery store. Variety is one of the things that nutritionists stress the most. Variety is important for both nutrition and psychological reasons. A varied diet is essential for a person to maintain good health and to maintain good psychological well-being. Feeling deprived of your favorite foods can cause you to give up a healthy lifestyle. Variety allows you to incorporate your favorites with healthy foods and offers the chance for you to develop new favorites as well. It is important that you continue to eat foods that you like, but in moderation. Instead of giving up bacon, have it as occasional treat. The same is true for desserts and sweets. It is important that you eat from all the major food groups each day. See these groups in my healthy foods page. Choosing the best foods from these groups is very important. By combining these food groups, you are ensuring that your body is receiving the necessary nutrients that these items contain. Choosing a healthy diet means that you abandon foods with excess fat or sugar. It also means choosing meats from the lean section and removing the fat and skin from chicken. By doing this, you are eliminating unnecessary calories and excess fat. When you choose breads and cereals, it is important not to choose those that are loaded with sugar or overly refined. Choose whole grains that have not been enhanced. Many of these whole grains are also fortified with additional vitamins and minerals. This ensures that you are receiving these extra nutrients. However do not rely on fortified foods alone. It is important that you get these nutrients in their natural form as well. Many foods are also supplemented with calcium and folic acid. These help to ensure that bones and teeth stay strong. Folic acid is essential in helping to prevent birth defects. If you can substitute healthy foods for those that are less healthy, you will be on your way. For example, you can substitute skinless white meat chicken for dark meat drumsticks. This is a good way to maximize nutrition without losing good food options. It is important that you choose a combination of foods that provide you with optimum nutrition. This means combining foods such as meats, beans, dairy and vegetables and whole grains to form a well-rounded meal. All of these foods combined together will provide you with the different nutrients that your body needs. Most foods are obviously healthy. However, it may be difficult to know whether some items are healthy or not. In this instance, you will want to look at the nutritional labels. Labels are required on all packaged foods and can be very helpful to those who are seeking a healthy diet. Not only do the labels tell you how many calories, fat grams and other nutritional information, but they also provide detailed information on the type of vitamins and minerals are in the food as well. When choosing a healthy diet, small changes can make a big difference. When you exchange fresh and low fat meals for high fat meals you will feel more energetic because you are not being “weighed down” by the high fat you were consuming in the past. You feel full without feeling bloated. You should also notice an increase in energy levels. By replacing highly processed grains for nutritious whole grains you will find that you are consuming more nutrients. Many of your highly refined foods are stripped of the nutrients and they do you little good in terms of a healthy diet. Cooking techniques are also important if you want to prepare a healthy diet. It is imperative that you don’t cook with high fat oil, but use a cooking spread instead. This ensures that you are not eating any unnecessary fats in the form of oil. If you cook vegetables too long, you may actually be cooking away significant amounts of nutrients. Take broccoli as an example. If you over boil it and then slather it in butter and cheese, you are cooking away nutrients and replacing them with fat. Boiling it too long can also cause them to lose nutrients. To prepare vegetables, you are often better off quickly steaming them in the microwave or over the stove. Cook them in as little water as possible, but use enough to keep them from becoming scorched. When you cook potatoes, it is a good idea to include the skin. The skin contains a lot of fiber, nutrients and minerals. You can also cook a baked potato in the microwave or grill to give it a better flavor. By using these methods, you will make the skin soft and minimize the need to load it with butter, sour cream, cheese, bacon, etc. In fact, healthier alternatives would include a little bit of nonfat cottage cheese or nonfat yogurt.